construction considerably more expensive. Land prices have also skyrocketed as population growth in metro areas has intensified demand for well-located sites. In addition, new regulatory barriers have also served to limit the supply of land available for homes and increased the time, complexity, and risks of housing development. Although the changes in homeownership by race and ethnicity are mostly positive, black households are the one group that has made no appreciable progress (Figure 3). 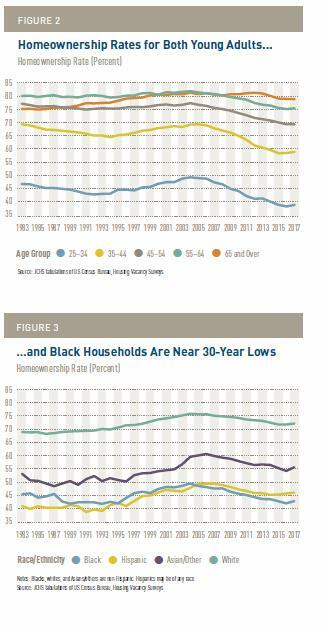 Compared with 1994, black homeownership rates have increased just 0.3 percentage point while white rates have risen 2.2 percentage points, widening the black-white gap to 29.2 percentage points. This disparity is even more troubling given that the gap was 23.5 percentage points in 1983, when the black homeownership rate was 2.6 percentage points higher than today. Although rates for both Hispanics and Asians have risen somewhat since 1994, the disparities with white rates are still substantial at 26.1 percentage points and 16.5 percentage points, respectively.